This volume, part of the Advances in Astrobiology and Biogeophysics series from Springer, leads the reader through all the hazards that could threaten life on a habitable world. The book starts by defining habitability and the ways in which the Earth provides a suitable environment for life and explaining the fundamentals of biology. Hanslmeier then describes the formation of stars and planets and the detection of extrasolar planets. The second half of the book deals with the cosmic catastrophes, detailing the hazard presented to life by everything from planetary impacts to supernovae and gamma-ray bursts. 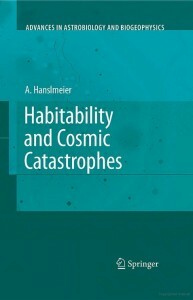 Hanslmeier covers a lot of material, and does present a good selection of the catastrophes that could threaten the Earth, or other potentially life-bearing worlds in the galaxy. The book is well illustrated and I’ve earmarked several of the figures reproduced here to use myself in future. However, I do hold several reservations about this book. The text could certainly have benefited from the attentions of a copy-editor, both in terms of readability and clarity of explanation. Many of the paragraphs seem to be random collections of facts gleaned from on-line sources, and there are plenty of statements that are ambiguous or misleading. Another example of carelessness is the caption to a figure directing the reader’s eye to the pink deposits and bluish-green bands, on a black and white photograph. On the whole, this book offers a broad introduction to the topics of planetary habitability and threats to a biosphere, but is held back by poor writing.